The hotel Luční bouda is situated in the first zone of National park Krkonoše and that´s why it is not allowed to arrive at the hotel by car. You can park your car in the car park in Pec pod Sněžkou or in Špindlerův Mlýn. We provide transport to the hotel for our guests from Pec pod Sněžkou - more information HERE. from Pec pod Sněžkou along the asphalt road past the mountain huts Richtrovy boudy and Výrovka (you can walk a part of the way from Pec pod Sněžkou either following red tourist sign through the Green valley (Zelený důl) or towards the Blue valley (Modrý důl) and Richtrovy boudy). A nice hiking path in summer is that through the valley Obří důl (Giant valley) to the saddle Obří sedlo across the peat bog Úpské rašeliniště as far as Luční bouda. from Špindlerův Mlýn - you can choose from several possible hiking paths. Those who like ridge walks will enjoy the footpath past the mountain hut Špindlerova bouda along the mountain ridge above lakes Wielki Staw and Maly Staw and along the recently reconstructed Amber pathway as far as Luční bouda. 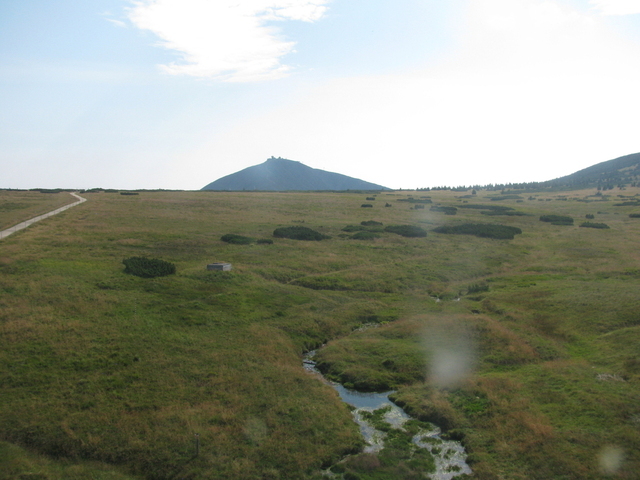 Another possibility is to go from Špindlerův mlýn along the green tourist sign to the mountain hut Výrovka and from here past the chapel as far as Luční bouda. A nice hiking path in summer is that through the valley údolí Bílého Labe along the blue tourist sign or the hiking path over the ridge Kozí hřbety on the red tourist sign. The nearest station is in Svoboda nad Úpou, from where buses to Pec pod Sněžkou depart. You can get to Svoboda nad Úpou by train from Trutnov hlavní nádraží. However, it is sometimes better to take a bus from Trutnov to Pec pod Sněžkou. You can go by cableway from Pec pod Sněžkou to Růžová hora or as far as Sněžka. Take the red tourist path down the mountain and continue along the blue one as far as Luční bouda. It is only 3,5 km far.